This document applies to Addons. GD Core plugin translations are located on WP.org. See the Translators Handbook for more information. GeoDirectory Addon translations are maintained in the GeoDirectory language project. In the example below, an Italian translation will added to a multi-lingual GD site. The process for a single language site is the same. 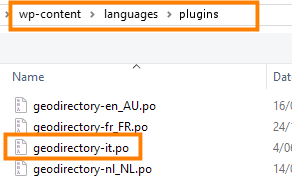 Navigate to the GeoDirectory language project pages. Select the language and addon of your choice. Load the file to the proper folder (See Translating Addons for more information). Change the file extension, if necessary, for your locale. Example: -it to -it_IT. Review the translations on your site. If you find untranslated strings, refer here for how to translate strings with PoEdit.